The Best In Eye Exams! Our Doctors are Experts in their Specialties, and they will thoroughly examine your Eyes. We will diagnose the problem(s), and we will do everything within our means to maximize your overall Ocular Health. If Glasses or Contacts are prescribed, not only do we have the Best Products to offer at the Best Price, but we also have the most Amazing Optics and Lens Options, along with a Diverse Selection of Eyewear too! Not only can you shop in The-Optical-Shop which is located on site, but after your appointment you can even continue shopping our products online too! You can even Reorder Your Contacts or Glasses Online as well! To prepare for your visit, please download the following forms, complete them, and bring with you to your appointment. Click here to download a PDF of our Patient Demographics form. Click here to download a PDF of our Insurance & Payment form. Click here to dowload a PDF of our Consent & Release form. Click here to download a PDF of our Patient History Questionnaire form. Now that you have downloaded the forms to complete, would you like to make your appointment with one of our Doctors? 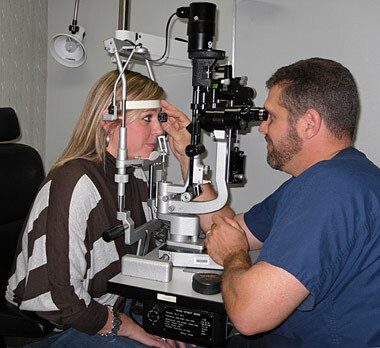 Eye Exams are an important part of Preventive Health. An Eye Exam is one of the best ways to protect your Vision because it can detect Eye problems at their earliest stage — when they're most treatable. At the Williamson Allemond Regional Eye Center, we believe in keeping Eyes healthy by detecting and treating small changes before they become big problems. Our goal of Routine Eye Care is maintaining good Vision for life. Our comprehensive Eye Exams include a careful look at the structures of the Eye, including the Retina, or lining of the back of the Eye, to screen for abnormalities or disease. The sensitive tissue that makes up the Retina is susceptible to a variety of diseases that can ultimately lead to partial loss of Vision or even complete Blindness, making early detection of any Retinal abnormality crucial. The Eye Exam includes screening for Cataracts, Glaucoma, Macular Degeneration and Diabetes, and other Eye Disorders that can affect your Ocular Health as well as your Vision. Our Doctors and Staff take time to make sure our Patients' needs are met and questions are answered. Following your Eye Exam, your Doctor will review the test results and discuss your options. From Glasses and Contact Lenses to LASIK, people often have several choices when it comes to Vision Correction. As your Eye Care Specialists, our goal is to help you understand which options are best suited to your Eye Health, your Vision and your Lifestyle.